Available Colors: Silver with Royal Blue, Red, Black or Lime Green Trim. Shipping Weight: 150 per carton @ 32 lbs. 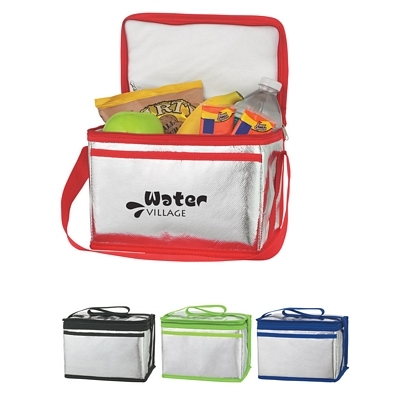 Customized Arctic Six Pack Kooler Bag (Item #HT-3315) is Promotional with a Free Artwork Imprint. Promotional Cooler Bags like our Personalized Arctic Six Pack Kooler Bag are decorated with your logo with no setup fees. Customized NonWoven Two-Tone Shopper Tote Bag Item #HT-3331 is Promotional with your business logo for advertising to clients. 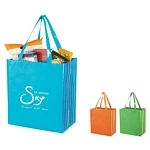 Customized NonWoven Two-Tone Shopper Tote Bag and other Promotional NonWoven Tote Bags are decorated with No Setup Fees. Customized Shiny Laminated Non-woven Tropic Shopper Tote Bag (Item #HT-3332) is Promotional with a Free Artwork Imprint. 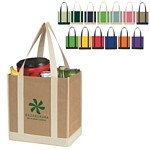 Promotional Shopping Tote Bags are decorated with your logo with no setup fees. 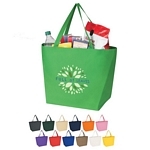 Customized Non-Woven Budget Shopper Tote Bag (Item #HT-3333) is Promotional with a Free Artwork Imprint. 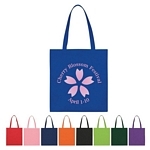 Promotional Shopping Tote Bags like our Personalized Non-Woven Budget Shopper Tote Bag are decorated with your logo with no setup fees. Customized NonWoven Expo Economy Tote Bag Item #HT-3330 is Promotional with your business logo for advertising to clients. Customized NonWoven Expo Economy Tote Bag and other Promotional NonWoven Tote Bags are decorated with No Setup Fees.